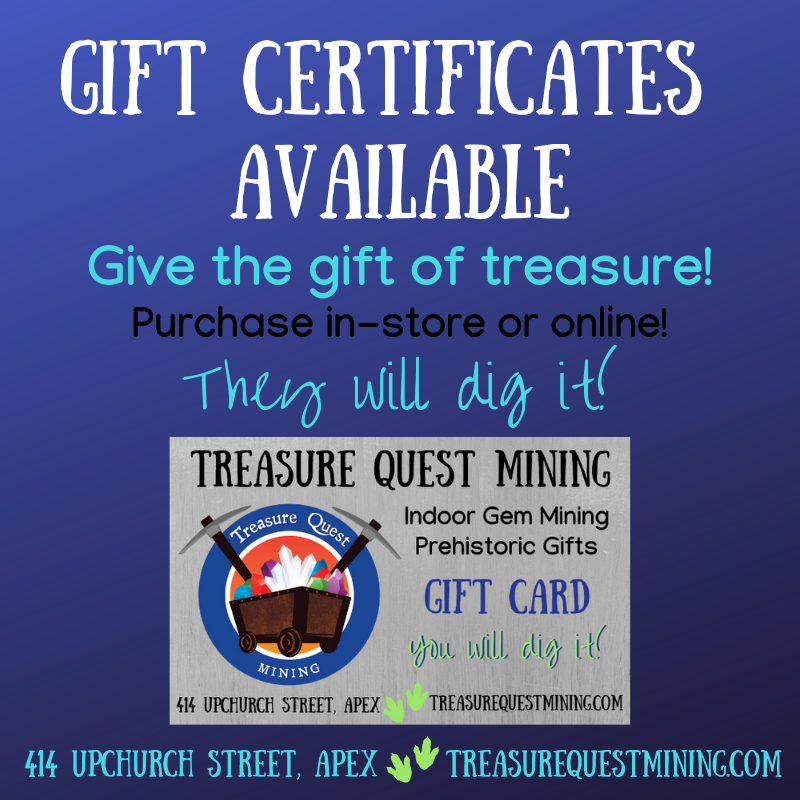 This package is a self-guided, mining expedition that you host using our store and party room! You run the show! This package offers the greatest value and flexibility with your party. With this package, you serve as the party host in our space. You and your guests will have use of the sluice and the party room for a combined total of one hour. Our staff will provide you and your guests with an overview of how to mine and then be available to you with any questions you may have. Once your guests are done mining, you can move to the party room. You are welcome to bring outside cake/cupcakes but no other outside food or drink is allowed. We will provide you with paper products and a drink for each miner. You have the option of ordering pizza from us for your party-goers if you would like. As the party host, you would serve your guests. Our staff will take care of the clean-up after your party. With this party package, your guests will receive a special birthday-party-sized bucket of mining rough, which has 50% more treasures in it than our Rockhound or Beachcomber bucket. Our party buckets alone have a retail value of $15; your package also includes the use of the space, paper products and one drink per miner. We carry an incredible assortment of prehistoric gifts that would thrill your rockhound or aspiring paleontologist! We offer a variety of treasures priced under $20. Purchase your gift at our store oronline. Share with grandparents, aunts and uncles, party guests! Gift Certificates available in our store or you can purchase aneGift Card online! Base Price: $169 for the first 10 miners, we can host up to 20 miners! This is the package minimum. The birthday person is included in this count (birthday person + 9 guests). Each additional miner: $12.50 each. Up to 20 miners in total. Add a geode: We have several sizes and prices to choose from, including mini-geodes for $.80 each when you purchase 10 or more. Add a party favor: Choose from a large selection of gem and dinosaur-themed treasures in our Prehistoric Gift Shop. Enjoy a 10% discount on party favor purchases in lots of 10 or more. Cake: You are welcome to bring your own cake, cupcakes or cookies allowing you to tailor the theme to your child’s liking! We do ask that you refrain from bringing any other foods, drinks, snacks or ice cream/popsicles. Thank you. Pizza: You can add pizza to your package! We order one-topping large Papa John’s pizzas for an additional $16 per pizza. We recommend 1 pizza per 4-5 children (depending on age). Each pizza has 8 slices. We supply you with paper products (plates, napkins, forks). All you need to bring is the cake and candles! Included in the package is one drink per miner. Bottled water or juice boxes. No carbonated or caffeinated beverages. Additional drinks can be purchased for $1.00 each, or you can add a drink package for a flat $5 to include drinks for all of your guests. Most families add the $5 drink package so they can provide a drink to everyone without worrying with $1/per bottle charges. This package includes the use of the sluice and party room for a combined total of one hour. Children typically take 20-25 minutes to process the mining rough (each child’s pace is different). 20-miner maximum: We can accommodate 20 miners on the sluice. We have a small party room, so be prepared for things to be snug, but manageable, with 20 kiddos. Definitely standing-room-only for parents! You have the option to choose from two mining rough mixes. You can choose either a Rock or Beach bucket, but should only provide one bucket per child in order to keep the party on schedule. Our birthday party buckets have 50% more treasure in them than our Rockhound or Beachcomber buckets offered through the store. This size bucket is exclusive to our party guests. Rock bucket – mining rough that includes gems, rocks, and minerals. View our Gem Identificationpage to explore the types of stones you may find. Beach bucket – mining rough with seashells, fossilized sharks’ teeth and other beach finds. Explore ourShell & Fossil Identificationpage to explore the types of shells and sharks teeth you may find. We schedule weekend parties on the even hour; 10:00, 12:00, 2:00 or 4:00. 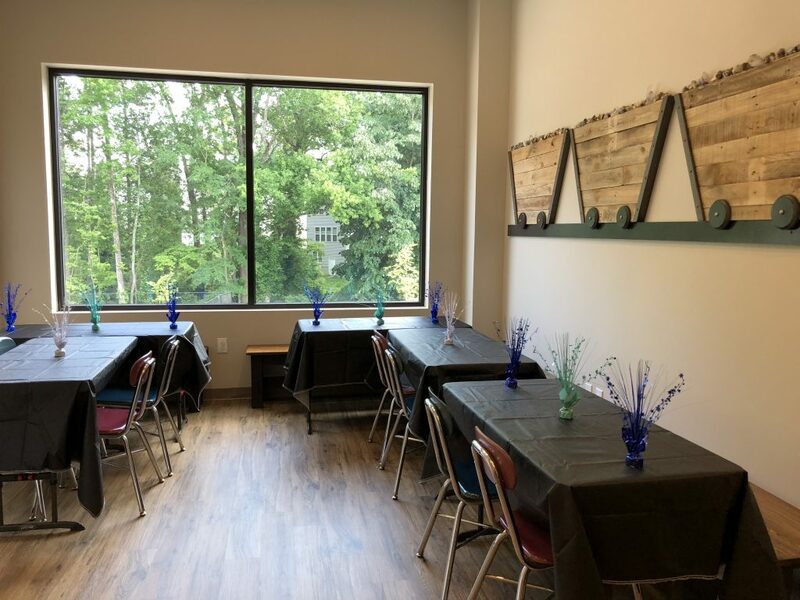 We are able to offer weekday parties, both during the daytime or after our normal business hours. Contact us by phone or email to reserve your preferred date and time! You are welcome to bring balloons for your party. Our ceilings are 12-14′ tall, so please be certain to have a long string or ensure that they are securely fastened to a balloon clip. No confetti or piñatas, please. No sparkling or trick candles. No alcohol or smoking allowed. A $50 deposit (+tax) is required at the time of booking. It is non-refundable and non-transferable but does apply toward your total balance due. Age Considerations: As our gem mining activities and geodes contain small and sometimes sharp pieces, these activities may not be appropriate for children age 3 and younger. *Prices do not include sales tax. Sales tax will be applied. Sign up to receive emails from us!